Key Studies - Memory A brief summary of the aim, method and findings - along with some evaluative points - of all the key studies required for the memory module in AQA Psychology. Conformity - Asch's Research (Spider Diagram) Brief summary of Asch's Research. Psychopathology Notes Providing detailed notes on Psychopathology which will be needed in the AS/A level years to pass your exam. All AO1 and AO3 is in the document consisting of variety of case studies to choose from as well as a variety of evaluations. It is also perfect for if you have missed a lesson and want to catch up. A* notes for Attachment Detailed but easy to understand notes for Attachment. Includes AO1s and AO3s to get you full marks in each essay. Written for the NEW 2015 AQA Psychology spec. AQA A Level Psychology: Attachment Essay Plans Essay plans of every possible 16 marker from the AQA A Level Psychology course, in the Attachment section. AQA Memory Notes Providing detailed notes on Memory which will be needed in the AS/A level years to pass your exam. All AO1 and AO3 is in the document consisting of variety of case studies to choose from as well as a variety of evaluations. It is also perfect for if you have missed a lesson and want to catch up. AQA AS Psychology Attachment Complete Revision Notes Complete set of detailed revision notes for AS Psychology AQA. Includes Bowlby, Reciprocity, Internactional Synchrony, Schaffer, Role of the Father, Harlow, Lorenz, Ainsworth's Strange Situation and so on! AQA Psychopathology New Spec 2018 condensed 16 markers all you need to know AQA specification for PSYCHOPATHOLOGY In line with the new specification Condensed, with good evaluative points. Just understand and remember all the information. You\'ll be on your way to getting that A*. Psychology Approaches Psychology approaches notes specific to AQA examboard. Includes notes for origins of psychology, behaviourism (the learning approach), social learning theory, the cognitive approach, biological approach, the psychodynamic approach, humanistic approach and a comparison of approaches. AQA A Level Psychology: Psychopathology Essay Plans Essay plans of every possible 16 marker from the AQA A Level Psychology course, in the Psychopathology section. AQA AS Psychology - Multi Store Model of Memory Essay Plan for a 12 marker essay about the multi-store model of memory in AS Psychology. The role of social influence processes in social change (16 marks) Full mark essay from the topic of Social Influence. Written for the NEW 2015 AQA Psychology spec. It hasn\'t been officially published anywhere so you can submit it as your own. Situational variables affecting obedience (16 marks) Full mark essay from the topic of Social Influence. Written for the NEW 2015 AQA Psychology spec. It hasn't been officially published anywhere so you can submit it as your own. Research into the role of minority influence (16 marks) Full mark essay from the topic of Social Influence. Written for the NEW 2015 AQA Psychology spec. It hasn't been officially published anywhere so you can submit it as your own. Misleading Information and EWT (16 marks) Full mark essay for misleading info and EWT from the topic of Memory. Written for the NEW 2015 AQA Psychology spec. It hasn't been officially published anywhere so you can submit it as your own. Explanations for forgetting - Retrieval Failure (16 marks) Full mark essay for retrieval failure from the topic of Memory. Written for the NEW 2015 AQA Psychology spec. It hasn't been officially published anywhere so you can submit it as your own. Multi-Store Model (16 marks) Full mark essay for the MSM from the topic of Memory. Written for the NEW 2015 AQA Psychology spec. It hasn't been officially published anywhere so you can submit it as your own. 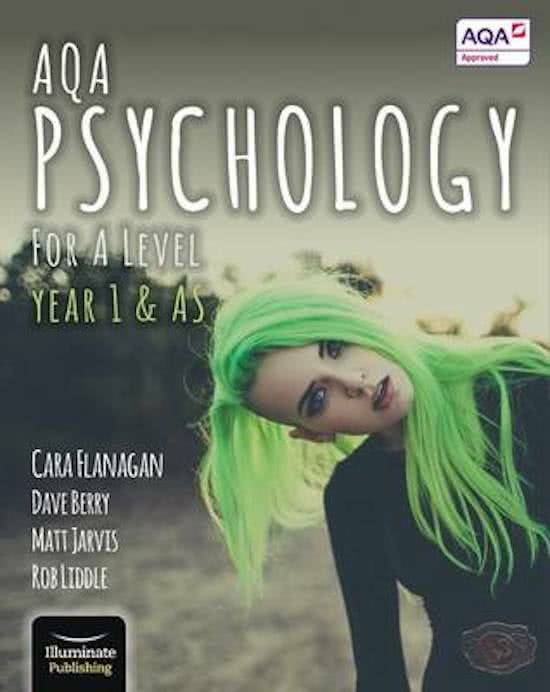 En esta página hay resúmenes, apuntes, guías de estudio y mucho más para el libro de texto AQA Psychology for A Level Year 1 & AS - Student Book, escrito por Rob Liddle & Cara Flanagan. Los resúmenes los han escrito los propios estudiantes, lo que te ayudará a hacerte una idea de lo que es importante estudiar en ese libro. Se tratarán temas como aqa, AQA, Psychology, psychology, attachment, notes, Memory & a level.